Ralph doesn't muck around with little sticks or balls, no he's out to be noticed and please his dad. Just don't get in his way, he hasn't quite got to grips with how wide this thing is. I'd like to see him pass through a doorway! To gorgeous. That stick must be heavy. What a dog! Stick! Where are you going with Ralph? 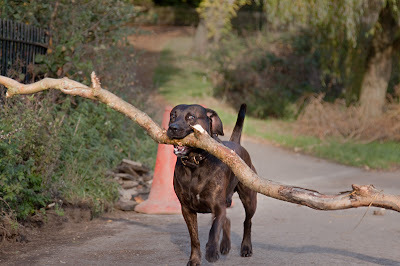 thats a whopper of a stick! And the photographer really got eye contact with the model. A great shot!! Heck of a grip that pup has! Wonderful photo. At this rate, Ralph will have enough material to build a dog house. FETCH! What a great shot. Ralph is a pleaser for sure. haha, that's so cute! my dog does this too. Wow, that is one crazy stick. Great shot! Our first Dalmatian used to carry huge logs and then have to work out how to take them through narrow gates from area to area of the forest. She was always happy to leave them when it was time to go home. Ralph, you overachiever, you! I'm sure your dad was indeed pleased. That's a strong dog! You have some great pictures here,, would you mind to exchange link with me? Now if you could get him to do that regularly, say twenty times a day, you'd have a great log store! Fantatsic dog and picture. Is the tree surgeon still stood on the other end?! He must have the strongest jaw ever! This beautiful strong dog looks so full of life and character. His dad must have many happy days with him. Thank you very much for making me smile today! :-))))))) What an ambitious dog! I would've followed him to see if he gets stuck somewhere :-D. Very cute! This pic reminds me on my dog. My Staffie Mable loves nothing better than trying to pick up the biggest branch you could ever imagine and walk with it her mouth.